The circle which Wolf built in the centre plot of the three we rented. It is 28ft in diameter and has four altars in the four directions. Here you see the entrance in the northeast and in the centre is the upside down tree in memory of Seahenge, uncovered on the North Norfolk coast in 1998, and subsequently confiscated by English Heritage and locked up in a museum - heinous crime. To the right of it can be seen the West altar dedicated to Archangel Gabriel. When Wolf met me I was already an ordained Priestess of Wicca (white witch) and so he could be said to have stumbled on witchcraft rather than chosen it. He took it in his stride, as he did everything, and asked me to explain what it was about. After asking a few questions, he said he thought he could go with that, and we went ahead with initiation, after which he and I worked together as High Priest and Priestess. He applied the same method to astrology and tarot, I explained how it worked, he asked to see it demonstrated and, having got that under his belt, accepted it too. He was very much into the Old Ways, being a nature worshipper, and I was surprised when he told me that many of the old pagan customs, forgotten here, were still celebrated in Germany, such as rolling the burning wheel down the mountain to celebrate the return of the sun. South Germany is still in touch with its pagan roots. We worked for the good of the community, and solved many cases that looked hopeless on the face of it - people have to reach the end of the road before they seek supernatural help - so it was always amazing to me how things worked out. Here is Wolf planting the upturned tree (tree with roots in the air). 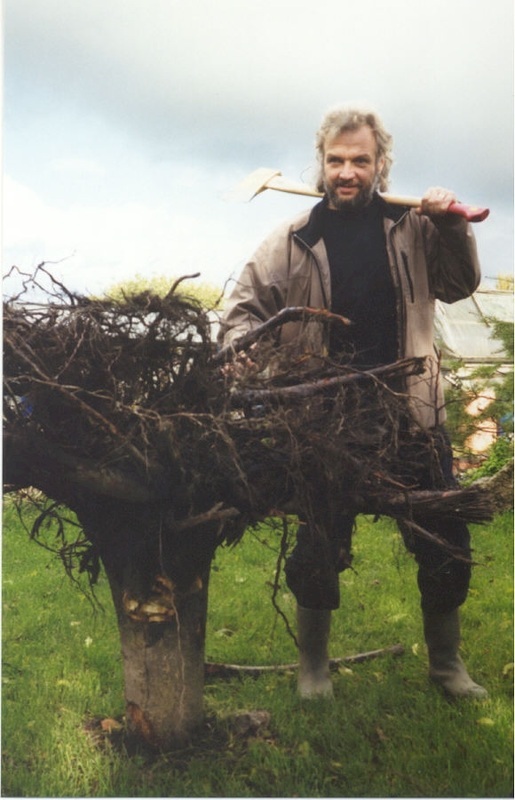 Some big old trees had been uprooted by builders near the allotment. We bought the big axe and he chopped through the trunk, manhandled it back on the wheelbarrow (not easy) then 'walked' it across the grass to drop it in the hole he had made. Just after the consecration, a little breeze sprang up among the big trees at the back of the allotment, and they sent a scattering of their leaves over us, as if saying 'Thankyou for honouring us'. As time went on and people wanted to join us, a coven formed and met on our allotments. We celebrated the fire festivals, solstices and equinoxes, and these gave meaning and rhythm to the seasons. We met at full moon also, and every ceremony was followed by feasting. 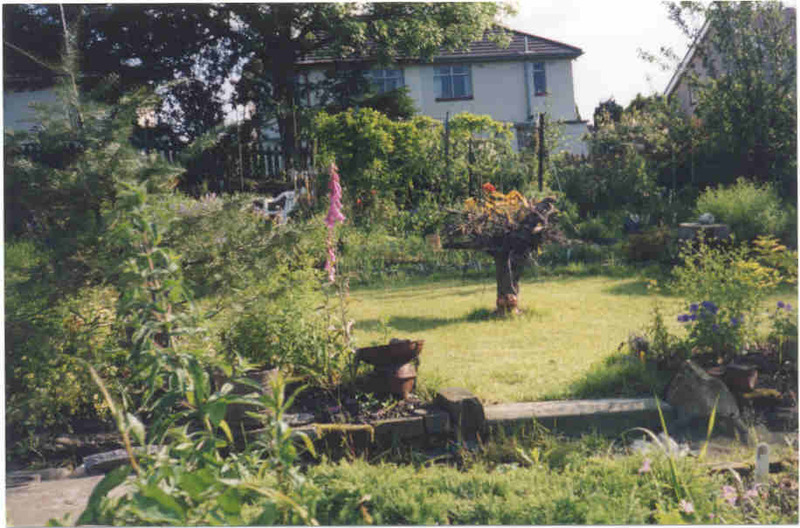 Best of all though were our wedding anniversary parties, always held on the allotment and well attended. It says something that people will turn out on the 10th of October, not the best month! The one I remember most was our tenth anniversary, when we fired a rocket at the moon at 10 to 10, from Wolfram’s terrace. The Moon was in conjunction with Jupiter at the time, which is especially favourable. On that day also, we took a bouquet of flowers to the Registry Office where we married, and requested that they be given to the couple marrying nearest to the time we had married, and with the hope that they would be as happy as we were. One autumn Phil Smith got in touch with us, and asked to attend our equinox festival. I remember he asked “Will there be crackling flames?” - he was a radio broadcaster! This was the beginning of a happy friendship which continued over many years, and he used me and Wolfram in many of his pieces for Radio Lancashire and Radio 4. He also included me in his living history book. 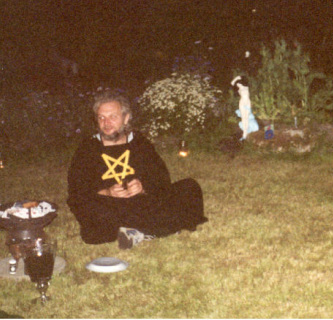 We made many memorable friendships through wicca, and got to know some extraordinary people. 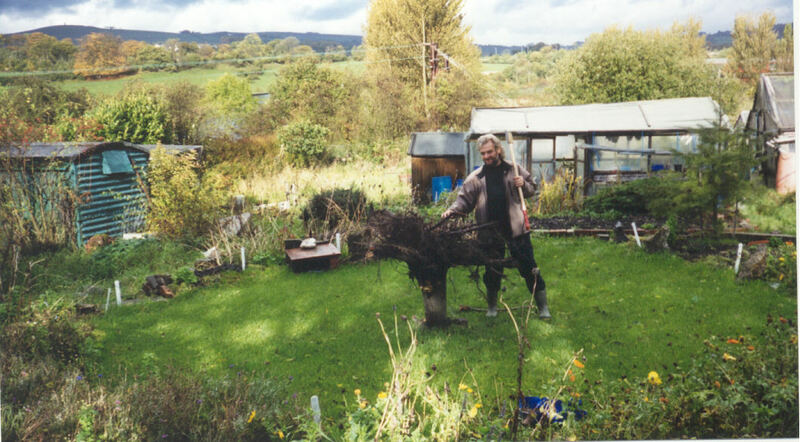 Wolfram, though, at the end of his life, learned of the love of Jesus from the good folk at the Methodist Church, Killarney, and was beginning, with their help, to turn his life around. I met all his friends there and they are some of the best people in the world, and I can’t thank them enough for what they did for Wolf when he was at a low ebb, and for the wonderful Irish funeral they gave him on 7th February 2006. Wolf at a ceremony in our allotment circle. He loved the fuss the women made of him. He was the only man there! Left, Wolf with the upside down tree, closeup. 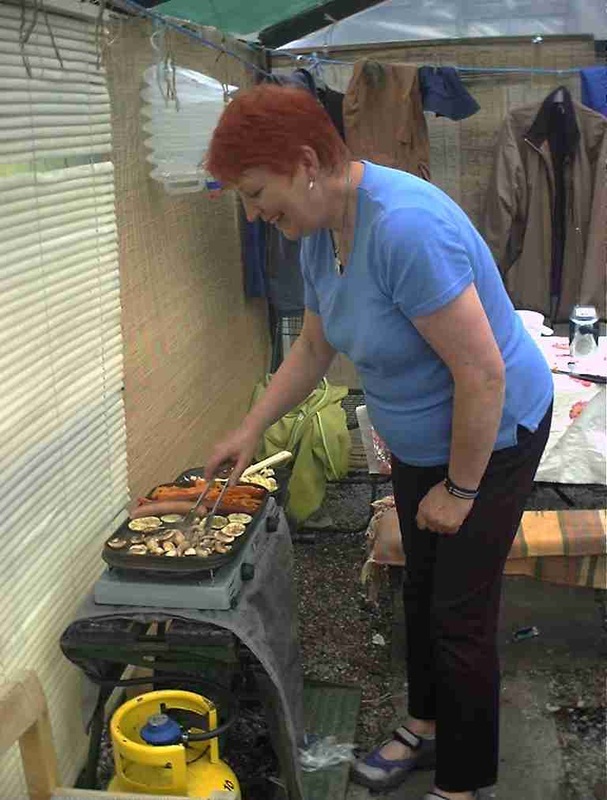 Above, Val cooking for the troops in the allotment. 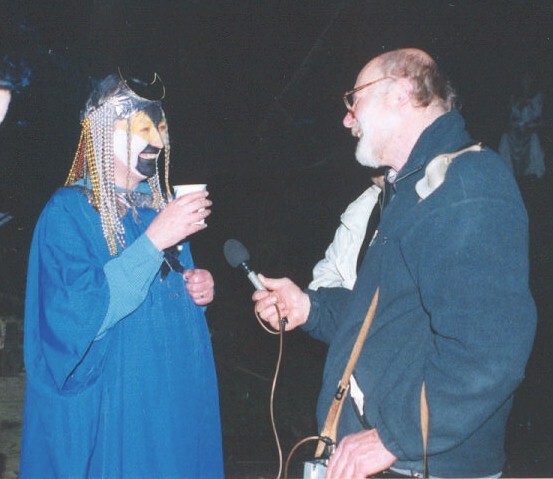 This recording was made on (Mad) Janet McLardy's land at the top of Brunswick Street, Nelson on 31 April 1997. Wolf and I, as High Priest and High Priestess, celebrated the coming of Spring. That was the night we married Debbie Neely to her mate Mark, as they jumped over the Beltane Fire. Debbie was the Maiden, and Janet wore potatoes in her hat and told Phil she was the Earth Mother. Wolf's friend Steve Laycock's sister can be heard making some disparaging remarks in what she believes to be cut glass tones, but sound more like tortured vowels. I have no problem remembering the date, Hale-Bopp hung in the trees behind the sheds, and under its light I wished for a woman friend 'who would love me as much as my first sweetheart Rita loved me when we were six'. Be careful what you wish for! A year and a day later, in that same spot, we celebrated Beltane with the Cuban, who had just arrived off the plane from Miami. Although she had come on a two week visit, I had the strangest feeling that she was not going home. She did go, but by August had persuaded her husband to fund her to live in England, with us. Be that as it may, and that story is told elsewhere. The piece is around fifteen minutes long, but well worth listening to.